We can confidently say that everyone knows at least one person who makes more eye contact with their phone than people. Technology has undoubtedly changed the way we communicate, whether that is good or bad remains your choice. Although this hasn’t changed the work we do, the deliverable results have. The access to resources, such as people and information, has expanded and the time expected to complete tasks or respond to issues has reduced. Facts and figures are thrown around all the time, just a few for you, the first iPhone was only released by Apple in 2007. The percentage ownership of smartphones globally has increased from 6% in 2009 to 22% in 2013 (Business Insider Australia). One in Every 5 People in the world own a smartphone, one in every 17 people own a tablet. What does this mean for our employees? Has changes in the work environment changed what employee attributes lead to success? 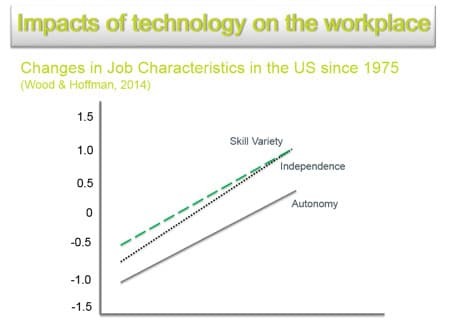 The below graph represents this changed from a recent study by Wood & Hoffman, this is US based and demonstrates the rapid increase in the requirements for employees to have a variety of skills, be independent and autonomous. Have the qualities of a successful graduate changed with the increase in the demand to be more autonomous, interdependent and highly skilled? These competencies are still important, and the importance of these is even more so in the modern world of world. What has changed is how graduates apply these core competencies. For example: While meetings with colleagues, managers and stakeholders will still occur, they are more likely to occur via eCommunication methods rather than face-to-face meetings. Given that Graduates are required to demonstrate their competence with more information and less time. Assessment techniques need to ensure they are meeting these demands. Global research has consistently shown that when assessing for behaviours that are likely to lead to success on the job, work samples and realistic scenarios are the best predictors of future performance (behind aptitude testing and behavioural interview). Therefore the context of assessment activities needs to reflect the modern world of work. This is most true for current graduates born into the digital age. The changes in technology also impact on attraction and selection strategies for graduates. Companies now have the opportunity to source and select graduates from a global market. This increases the number of graduates that companies need to evaluate. However, the expected time and methods for selection have remained the same, thus calling for greater efficiency in the selection process. Further, assessment activities must be flexible enough to allow for testing anywhere in the world, at anytime, with easy and quick access to assessment results. When discussing the gaps in technology the first area was incorporating technology into assessment centre/behavioural activities, the Graduate Simulation is one solution for this. Realistic work situation The company gains an understanding of how Graduates are going to behave in a modern business environment. Scenarios are targeted at a Graduate level. Administered online Graduates can complete this assessment anywhere where there is an internet connection, when compared to traditional behavioural activities, saving companies time and money on travel costs. Short Completion Time This simulation only takes 30 minutes to identify graduates likely way of behaving on 4 core competencies (planning & organising, applied problem solving, decision making, email communication skills). Unlimited number of Graduates can complete at the one time Companies can assess behavioural fit information about more graduates in a shorter period of time than other traditional behavioural assessments, such as face-to-face interview and assessment centres. Tailored to company and/or industry terminology While the simulation is quite generic, companies have the opportunity to promote their work environment and assists Graduates to self-select out of the role before they are hired, saving company time and money in the long term. Translated into different languages Graduates results can be compared for different roles across the world. Very useful if you have graduates based all around the world in different roles. You can still compare them, but on the same playing field. Flexible to be incorporated into other selection methods Companies can assess graduates culture fit while also benefiting from the additional benefits of the eSimulation. This solution is a cost effective method of obtaining key information about your Graduates, particularly in stakeholders in the business and/or Graduates are widely dispersed. This method has been used in the US for over 15 years.